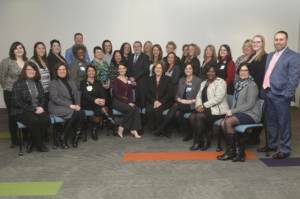 A group of 23 nurse leaders throughout our system recently completed the 2018 Accelerated Nurse Leadership Cohort (ANLC), a program sponsored by the CNO Council. This cohort presented their work on four capstone projects to Dr. Bieber, the CNO Council, and other senior leaders on March 9. ANLC is an invitation-only program that leverages an accelerated framework designed to ensure that each participant emerges with stronger leadership skills. This program also provides opportunities for participants to collaborate with colleagues from across the health system. Posted April 1, 2018 under _Featured Stories List, Locations, News, Nurses, Weekly Beat.